There are many scenarios when buying expensive high-end HVAC manifold gauges are unnecessary. Mainly for those who only occasionally work on A/C units or a homeowner looking to do his or her own repairs. Below we list units that will get the job done without breaking the bank. The units below would not be good for a busy HVAC shop and wouldn’t be able to stand up to the wear and tear of constant use. They would be good for infrequent use for DIY individuals. 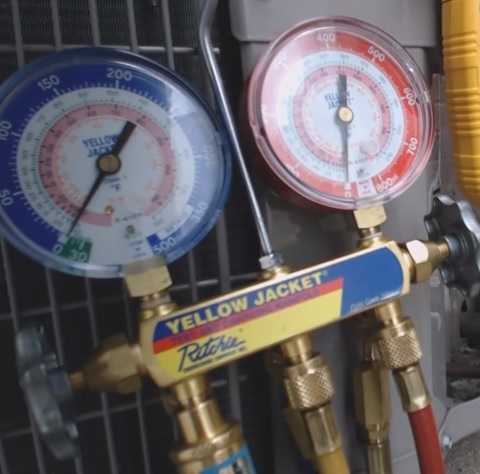 Yellow Jacket makes many good HVAC Gauges with the 42001 a nice analog set. It can read R-22, R404A, and 410A refrigerants each with a different color code for easy reading. While there units that cost less for the price they are a good buy for a set that will work well and last. Mastercool also makes many good gauges with the 59161 being one of them. They can read R-22, R404A, and 410A and have a brass manifold body. For the price, they are a good set and would be good for someone who does the occasional A/C work. This Yescom set is very low cost built to work with R410a. While not the best they will work in a pinch and could be used in many other scenarios such as simply pumping down a unit. They are not built for a professional and only a low cost set for the occasional home repair person. 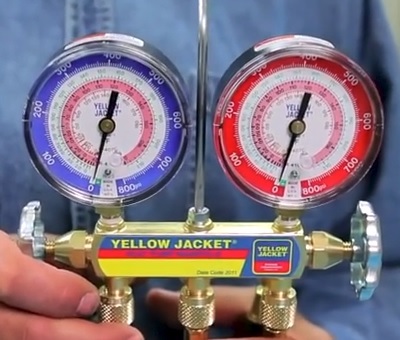 A quality HVAC Manifold gauge set are not cheap items and can cost for high-end units. While the cost will no doubt benefit an HVAC tech who needs to depends on them daily the average user can get by with a budget set. A good example of this is DIY Mini Split A/C units that need to be pumped down to a vacuum. Most who install such DIY Mini Splits likely will never use the manifold gauges again or only if a problem occurs with the Mini Split system. Such a scenario would make a cheap low coast set a good option. As with any low-cost item, the quality may be lacking so be sure to read reviews on Amazon, forums, or elsewhere to be sure a unit is a good pick for you.